When I received the email advising of the imminent arrival of Sripad Goswami Maharaj at Villa Govinda in Italy, I could hardly contain myself. 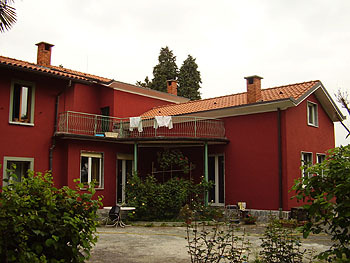 I had only recently returned to Malta after spending a glorious few weeks with the Italian devotees over Sri Gaura Purnima; in Rome, Terni, and finally Villa Govinda near Milan. How could I now find an excuse for the expense involved in flying back and forth so soon? I played a game with anybody who crossed my path in the next couple of days: "Yes or no?" I would ask. "Yes," they would all say, including my employer who had no qualms over letting me go again only five weeks on. So, thanks to the divine mercy of Srila Gurudev Srila Bhakti Sundar Govinda Dev-Goswami Maharaj, within a week I was delighted to be flying back to see my Italian family. 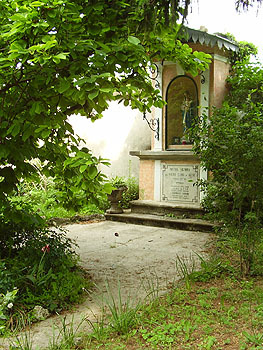 Villa Govinda is a beautiful ashram, manifested by the loving service of the devotees. Several devotees were about to gather here to have the association of Sripad Bhakti Sudhir Goswami Maharaj. 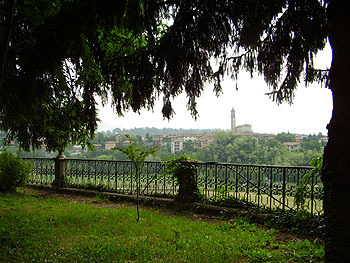 The view from the garden of Villa Govinda with Merate's church steeple towering in the distance. Merate would be the main target of much effort to distribute Krishna Consciousness in the next few days. 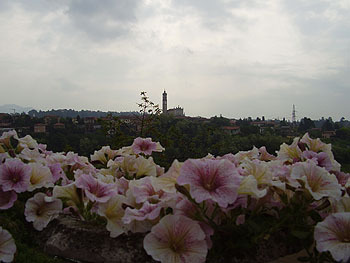 The gardens of Villa Govinda are very large, with plenty of flowers available in spring for garlands and offerings. 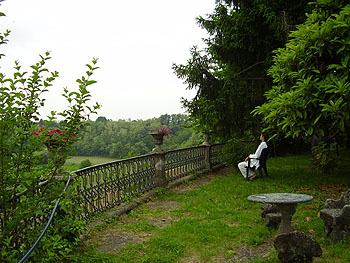 The Ashram stands on top of a hill, from where one can see that the surrounding area is heavenly green and peaceful - an ideal place for sadhana. 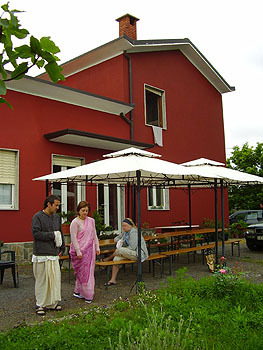 At one side of the ashram, the prasadam hall is extended outdoors, with the tables and seating also ideal for chanting japa and making flower garlands. This sweet niche of the Christian Madonna and child has been in the grounds since at least 1897, as the plaque indicates. Srila Gurudev was very happy with its presence. I was the first to arrive. I knew without a doubt that several other devotees would visit from neighbouring countries, but I had no idea to what extent. I was surprised that the next devotee, Nitai Sundara Prabhu, arrived all the way from the United States. Following over the next few days were groups of devotees from Hungary, UK, and other parts of Italy… a truly beautiful international gathering comprising more than six countries of origin, excluding states and provinces. Sripad Goswami Maharaj arrived later on the same day I did, on Monday 15th May. From the first moment when we welcomed him at the airport, he began to inspire us with his preaching - telling various stories and explaining philosophy - providing the Krishna-katha to quench our thirst.